Croker is comprised of three companies: Croker Fire Drill Corporation, Croker Fire Safety Corporation and Croker Fire & Life Safety Institute. Our mission is to continue with the initiatives set forth by our founder Edward F. Croker, Chief FDNY (1899-1911). Our focus is to provide unparalleled service to our clients by conveying the necessary fire and life safety procedures while utilizing efficient and effective techniques to minimize building management liability, provide safety awareness and preparedness, maintain high standards towards prevention and sustain a safe environment for all building occupants. Are you really confident about your fire/disaster safety plan and your staff training and readiness? Just how good is your prevention? Croker professionals will design the proper plan for your facility and work closely with you. Our guidance will be invaluable and our cost surprisingly modest. Is your staff properly trained? Croker professionals will patiently instruct your staff to prevent incidents and to respond to emergencies. How knowledgeable are you on all procedures? Croker professionals will guide you with the knowledge gained through extensive experience in the field. Does your present drill service leave something to be desired? Croker professionals regard drills and inspections as positively vital for a proper fire safety environment. Are you knowledgeable about the latest ideas in fire safety being used throughout the country? Croker professionals work in many different areas. This brings you an extra measure of experience and knowledge. Get the answers to your questions. Consult with Croker. For 27 years Edward F. Croker would serve his department in various ranks and eventually rise to become chief. Throughout his tenure, he would establish the credibility and respect of an accomplished leader. Years later, unbeknownst to him, his name would become one of the most recognizable within the fire and life safety profession and his words would be referenced by firefighters around the world. Edward Croker was an experienced firefighter and a pioneer in creating laws to safeguard against fire hazards. Although he had many times witnessed the destruction caused by fire, the horror of the Triangle Shirtwaist Factory fire caused him to fight for life-saving measures in fire prevention and safety. Chief Croker carefully studied the Asch building to determine the cause of fire and to make a case for changing the law. In his book, Fire Prevention, he used photographs to show the results of fire in non-fireproof buildings. Croker stated that the simplest way to prevent fire death is the simple drill. Knowing the location of exits and the use of clear signs and directions (which seem obvious today) were radical ideas at the beginning of the 20th century. In a city filled with immigrants without a common language, the giving and following of directions was not a simple task. For this reason, Croker proposed that, “…all instructions for fire drills should be printed in the language of the majority of the workers in a given shop; in two or three languages if necessary, in addition to English.” He recommended training a manager to take charge, and teaching workers how to behave in a calm and orderly fashion in the event of a potentially dangerous situation. Croker, Edward F., Fire Prevention. New York: Dodd Mead & Co., 1912. New York State Factory Investigating Commission, 1912, 3 vols. (Albany, New York: The Argus Company, printers, 2:5-6, 14-21, 35-36, 39-40. Photos courtesy of the New York City Fire Museum. 06/22/1884 At age 21, Edward F. Croker decided he wanted to leave his job as a brakeman for the New York Central Railroad to become a fireman. After just 47 days on the job, Edward was promoted to assistant foreman (today’s Lieutenant). 02/25/1885 Croker was promoted to Foreman (today’s Captain) of Engine Company 1. 01/22/1892 Foreman Croker became Battalion Chief Croker. 05/01/1899 Edward F. Croker was appointed Acting Chief of the New York City Fire Department. 06/29/1899 Edward F. Croker, after serving as Acting Chief of the New York City Fire Department for nearly two months was promoted by Fire Commissioner Scannell to be the Chief of the Department at the age of 36. He went on to become one of the most famous Chiefs of the Department. In announcing the promotion of Acting Chief Croker, Commissioner said that he had done so in pursuance of Section 728 of the charter which reads as follows: “The Fire Commissioner shall have power to select heads of bureaus and assistants and as many officers and firemen as may be necessary, and they shall at all times be under control of the Fire Commissioner and shall perform such duties as may be assigned to them by him, under such names or titles as he may cofer.” The preceding section of the charter states that the Commissioner shall have power to organize the department into bureaus, one of which shall be charged with the duty of extinguishing and preventing fires, the principal officer of which shall be called the “Chief of Department.” In many respects, the chief of department was a powerful figure, a brave and unencumbered truth teller who was expected to weigh in on matters of public safety. Edward F. Croker did just that, sometimes speaking out against the interests of hotel and real estate interests that influenced, if not controlled, City Hall, and resisted spending money on safety innovations that the chief called for. Before his retirement in 1911, part of Edward F. Croker’s legacy was his persistence to have new buildings fireproofed and equipped with rear doors and stairways. Croker was the first Chief who did not serve during the volunteer period. He was also the first Chief to use an automobile to respond to alarms. 1901 As chief, Croker did his best to modernize his department, donating the first motorized chief’s car (a 1901 Locomobile dubbed “the Black Ghost” in press accounts of Croker’s exploits) and attempting to streamline communications between firemen during emergencies. 1910 At the time of Edward Croker’s appointment as Chief of the New York City Fire Department in 1899, his uncle Richard “Boss” Croker Sr. was the head of Tammany Hall (the Democratic Party political machine that played a major role in controlling New York City politics). By 1910, many saw Edward’s position as a stepping stone to the Mayoralty. Croker denied any ambition with the following stirring words: “I have no ambition in the world but one, and that is to be a fireman. The position may, in the eyes of some, appear to be a lowly one; but we who know the work, which a fireman has to do believe that his is a noble calling. There is an adage which states that ‘Nothing can be destroyed except by fire’. We strive to preserve from destruction the wealth of the world, which is the product of the industry of men, necessary for the comfort of both the rich and the poor. We are the defenders from fire, of the art, which has beautified the world, the product of the genius of men and the means of refinement of mankind. But, above all, our proudest endeavor is to save the lives of men – the work of God himself. Under the impulse of such thoughts, the nobility of the occupation thrills us and stimulates us to deeds of daring, even at the supreme sacrifice. Such considerations may not strike the average mind, but they are sufficient to fill to the limit our ambition in life and to make us serve the general purpose of human society.” Although Croker’s blood connections may have given him his start, he was always determined to make his colleagues forget that he had them – continually venturing the deepest into danger and dedicating himself to the study of firefighting science, construction techniques and fireproofing. His ideas were the foundation of the Fire Prevention Law of 1911. 11/26/1910 Croker epitomized the dichotomy of the fire service; that is to put their expertise to use in fire prevention. He was an outspoken advocate of improving fire safety throughout the City’s commercial and residential buildings. As early as 1894 he testified before the Tenement House Committee that a fatal fire was due, in part, to “the combustible nature of the building and its open construction.” The culmination of this was when he used the fatal sweatshop fire in Newark, New Jersey to once again call attention to the threat of such a catastrophe being repeated in New York. 03/1911 Chief Croker issued emergency fire rules for loft factories including the installation of sprinklers, which at that time was not yet required by law. Croker stated there had never been a loss of life in a sprinkler-equipped building. The move rallied the manufacturers to organize a campaign against the regulations as an unwarranted interference in the conduct of commerce. Business owners banded together, forming the Protective League of Property Owners, and refused to install the sprinklers due to the construction costs. The factory owners found sympathetic ears in the city government, and Croker was shortly forced to withdraw his emergency order. 05/01/1911 After the Triangle Waist Factory Fire, suspecting that he could do little to advance his cause within the politicized tangle of government red tape, Croker turned over his command to Deputy Chief John Kenlon at 8:00AM. Edward F. Croker served twelve years the Chief of the New York City Fire Department and for twenty-seven years as an active fireman. Croker’s twenty-seven years of service had seen the administration of twenty-two Commissioners. 05/01/1911 Immediately upon his retirement Fire Chief Edward F. Croker, creates and becomes President of “Croker National Fire Prevention Engineering Company” a fireproofing and fire safety consulting and manufacturing firm specializing in fire prevention services and the manufacturing and supply of fire protection devices and interior fire equipment, most notably soda / acid fire extinguishers (including one titled the “Chief Croker” extinguisher) for the protection of buildings throughout the United States. Among the services provided, were instituting and conducting fire drills at big manufacturing plants. The company is headquartered at the Thorley Building at 562 Fifth Avenue (located at 46th Street and Fifth Avenue). (See Croker National Fire Prevention Engineering Company Advertisement) The Chief ran the company like his own fire department. Croker began operations with a staff of sixty men, each of whom had seen twenty years’ of service in the city department. All the employees were former FDNY members who wore uniforms, including a hat with badge. The company also had a promotional give-away item…a book of matches. Perhaps the Chief had a sense of humor.The company was also referenced / documented as “Croker Fire Prevention Construction Company” and “Croker Fire Prevention and Engineering Company” however it was later commonly referred to as “Croker Fire Prevention”. By 1922, the headquarters were relocated to 22 West 13th Street in Manhattan. 10/1911 To commemorate the 40th anniversary of the Chicago Fire, the Fire Marshals Association of North America proclaimed the nation’s first Fire Prevention Day to promote public awareness of fire safety. Fire-awareness programs and parades were held throughout America. 1912 A New York City Fire Department Fire Prevention Bureau was established. The new Fire Prevention Bureau was a reflection of the growing understanding of the importance of keeping fires from happening by educating people and promoting safety codes. 08/30/1912 Edward F. Croker, former Chief of the New York Fire Department was elected Generalissimo of the Long Beach Fire Department. Chief Croker stated that he proposed in the near future to call out the men under his command regularly every night for drill.In Long Beach, he had within ten days a fire combination truck, a staff of ten prominent volunteer firefighters, and a uniform of black trousers, blue shirts and red helmets, designed so that wealthy volunteer firemen could wear their uniform to social functions and not have to go home to change in case of a fire. 1914 Croker constructed what was believed to be the first “completely fireproof” home in the world, located at 116 Lindell Boulevard in Long Beach, NY on Long Island (corner property at Lindell Boulevard and West Penn Street). The house warming party he held on October 30, 1914 was covered in the New York Times. According to the Times’ story, Croker brought all his guests to the second floor of his home, where the walls, floors and rafters were made of cement, the doors, trimmings and furniture of metal, and, interestingly enough, the carpets and furniture coverings of asbestos. He poured a couple of gallons of gasoline into a room, lit a match and then shut the room’s metal door and dined with his guests in the next room. The fire was confined to the room, and beyond a reported crack in the metal wire of the room’s window, the room remained undamaged. 1925 President Calvin Coolidge declared Fire Prevention Week an official national observance. Ever since, the Sunday through Saturday period containing the October 9 anniversary of the Chicago Fire has been the focus of an annual fire-safety-awareness campaign sponsored by the National Fire Protection Association (NFPA). 05/06/1947 In 1947, President Harry S. Truman called for, hosted, and participated in the “President’s Fire Prevention Conference of 1947.” The participants in the conference were some of the brightest minds in America at that time. The purpose of the meeting was to identify ways to prevent fires. However, what evolved out of that meeting was the application of a military concept in dealing with safety. That concept was identified as the “3 E’s,” engineering, education, and enforcement and it applied well to fire safety.² The purpose of education is ultimately to change behaviors. Fires have for too long been generically categorized as “accidental.” For instance, the cause of a fire is blamed on a misplaced candle or materials placed too close to a furnace. The candle or furnace caused the fire not the person originally behind the action. Responsibility must be correlated between actions and persons with fire. Nearly all fires can be prevented with the “3 E’s. Education is the most cost effective fire suppression activity the fire service can engage in. By preventing fire from ever starting, costs to municipalities and the overlooked costs to citizens devastated by fire are dramatically reduced. 02/07/1951 Chief Croker died in Lindenhurst, New York (Long Island) at the age of 87. 1959 “Croker Fire Prevention”, one of the leading fire prevention companies in the United States was absorbed by “Fire-End Products” (founded October 20, 1931 and headquartered in Elmsford, New York). Under the direction of brothers Anthony and Joseph Sposato the company is later renamed to “Fire-End & Croker Corporation”. 01/18/1973 New York City adopts Local Law 5 for fire related emergencies. Included in this law are the requirements for High Rise Office Buildings to create and maintain a Fire Safety Plan, perform regular Fire Drills and have certified Fire Safety Directors on site whenever there is greater than 100 persons in the building. 06/13/1975 The Fire Drill division disbands from “Fire End & Croker Corporation”; Stanley Janovici becomes the President of “Croker Fire Drill Corporation”. Over the course of the next two decades, Croker Fire Drill Corp shows steady growth becoming an industry leader in fire and life safety consulting throughout New York and the surrounding communities. 03/27/1984 New York City adopts Local Law 16. Included in the law are provisions for hotels and motels within the five boroughs to create and maintain a Fire Safety Plan, perform regular Fire Drills and have certified Fire Safety Directors on staff 24 hours a day, 7 days a week. 01/01/1999 Ray Weinstein becomes the fifth President / CEO of Croker Fire Drill Corporation with offices headquartered in Islip Terrace, New York (Long Island). Over the next decade, Croker Fire Drill Corporation shows rapid growth throughout the states within the northeast region. 09/11/2001 The September 11 attacks (often referred to as nine-eleven, written 9/11) were a series of coordinated suicide attacks by al-Qaeda upon the United States resulting in 2,974 American casualties. On that morning, 19 Islamist terrorists affiliated with al-Qaeda hijacked four commercial passenger jet airliners. The hijackers intentionally crashed two of the airliners into the Twin Towers of the World Trade Center in New York City, killing everyone on board and many others working in the building. The hijackers crashed a third airliner into the Pentagon. The fourth plane crashed into a field near Shanksville in rural Somerset County, PA, after some of its passengers and flight crew attempted to retake control of the plane, which the hijackers had redirected toward Washington, D.C. There were no survivors from any of the flights. 06/24/2004 In the aftermath of the terrorist attacks on the World Trade Center (September 11, 2001), the 2001 anthrax attacks and the Northeast Blackout of 2003 (The largest blackout in North American history – August 14, 2003), New York City introduces Local Law 26 including bold new provisions in life safety throughout the city. These initiatives include (but are not limited to) emergency power supply to exit signs, photoluminescent markings in exit stairwells and expanded sprinkler requirements. Local Law 26 also outlines new FDNY Emergency Action Plan (EAP) protocols to be further researched and promulgated. 04/06/2006 The FDNY enacts new Emergency Action Plan (EAP) procedures/protocols requiring High-Rise Office buildings throughout New York City to have plans, drills and FDNY certified EAP Directors for non-fire related emergencies. 05/08/2008 Croker Fire & Life Safety Institute, Inc. is launched with FDNY accredited classes teaching Fire Safety Director and Emergency Action Plan Director candidates throughout New York City’s five boroughs. Classes are held at 188 Madison Avenue in Manhattan (adjacent to the Empire State Building). 08/12/2009 Topps (aka: The Topps Company, Inc) best known as a leading producer of trading cards, released its American Heritage Edition, which is a 150-card set loaded with notable people – who it deems the “the most courageous, valiant, progressive and enlightened American women and men in our nation’s history.” The base set utilizes famous Topps designs from the 1960s and the 1980s – focusing on Military Heroes (card Nos. 1-10), Political Heroes (11-20), Civil Rights heroes (21-30), “The Bravest” (31-40), “The Finest” (41-50), Heroic Groups and Movements (51-60), Heroes of Medicine (61-70), Humanitarian Heroes (71-80), Diplomatic Heroes (81-90), “Pen is Mightier than Sword” (91-100), Heroic Events (101-125), and finally Kindred Heroes – a 25-card set pairing Barack Obama and Abe Lincoln. 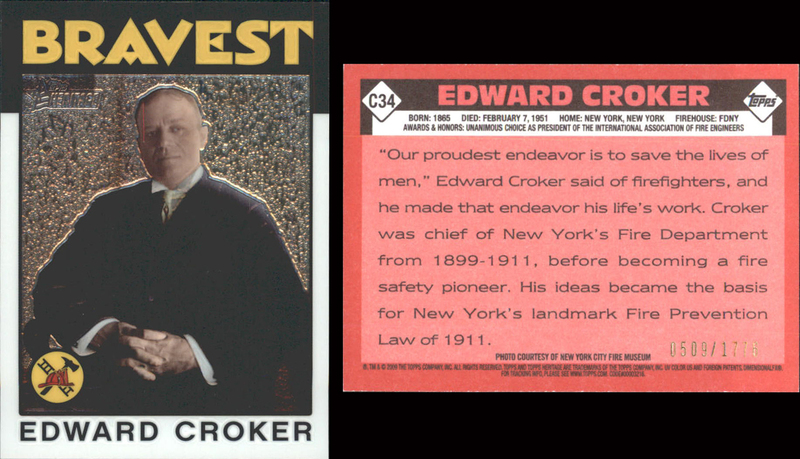 The founder of Croker Fire Drill Corporation, Edward Croker, was featured in this prestigious collection as card #34 (See image of Topps card / See image of limited edition Chrome Topps card). 05/01/2011 Croker celebrates 100 years of service in the fire and life safety industry. Present Servicing some of the most well respected corporations and real estate management groups in the largest and most prestigious buildings throughout New York City’s five boroughs and throughout the northeast region, Croker Fire Drill Corporation and Croker Fire Safety Corporation currently service in excess of a 2600 building, 375 million square foot portfolio marking the largest fire and life safety consulting company throughout the country. The 2008 New York City Fire Code: Are You Ready? Consult with Croker today for all your fire safety, emergency / disaster and life safety needs. THANK YOU FOR YOUR INTEREST IN FIRE AND LIFE SAFETY.